Hello! let’s go out have a cup of coffee and cake. How about I treat you with a slide of Secret Recipe cake? Like it? 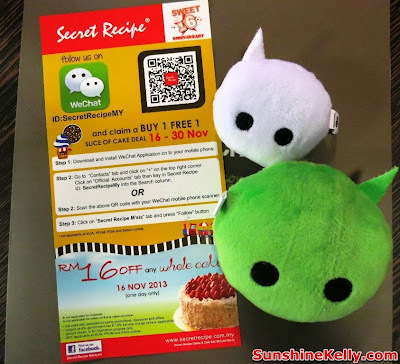 Good news to myself and share some happy news to all Secret Recipe lovers and also WeChat users. Secret Recipe Malaysia is the latest addition of Official Account in WeChat Malaysia. Secret Recipe Malaysia Joins WeChat Family was launched yesterday at Secret Recipe outlet in Oasis Ara Damansara, Selangor. 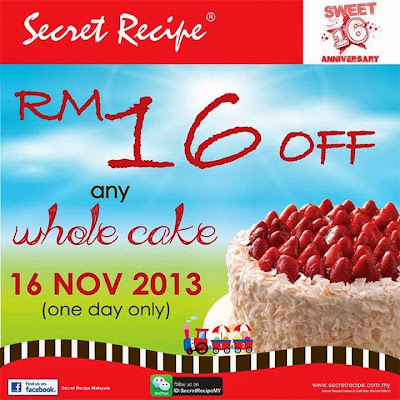 With that and also in conjunction with Secret Recipe Sweet 16th Anniversary celebration, there are a lot of sweet deals starting today. 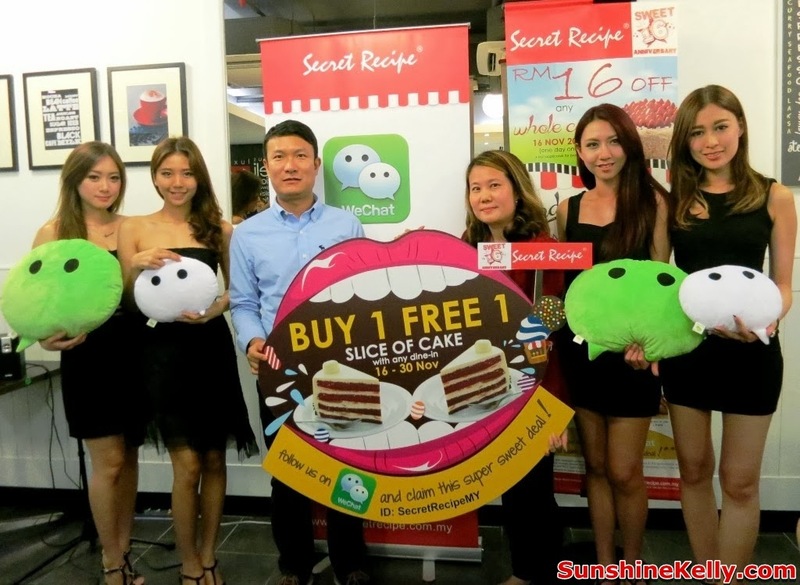 Step 1: Download and install WeChat Application on your smartphone. Step 2: Go to ‘Contacts’ tabs and click on the ‘+’ on the top right corner. 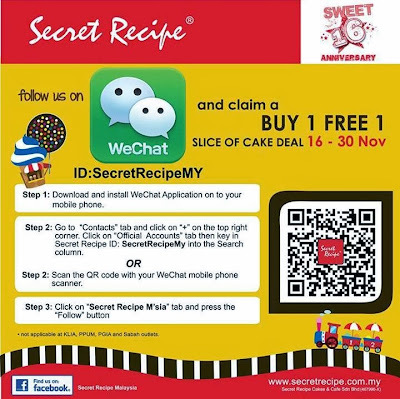 Click on ‘Official Accounts’ tab then key in the Secret Recipe ID: SecretRecipeMY or you can scan the QR code with your WeChat mobile phone scanner. By the way, don’t forgot about the Candy Crush deal! You get RM16 off for any Whole Cake on 16th Nov 2013 only. 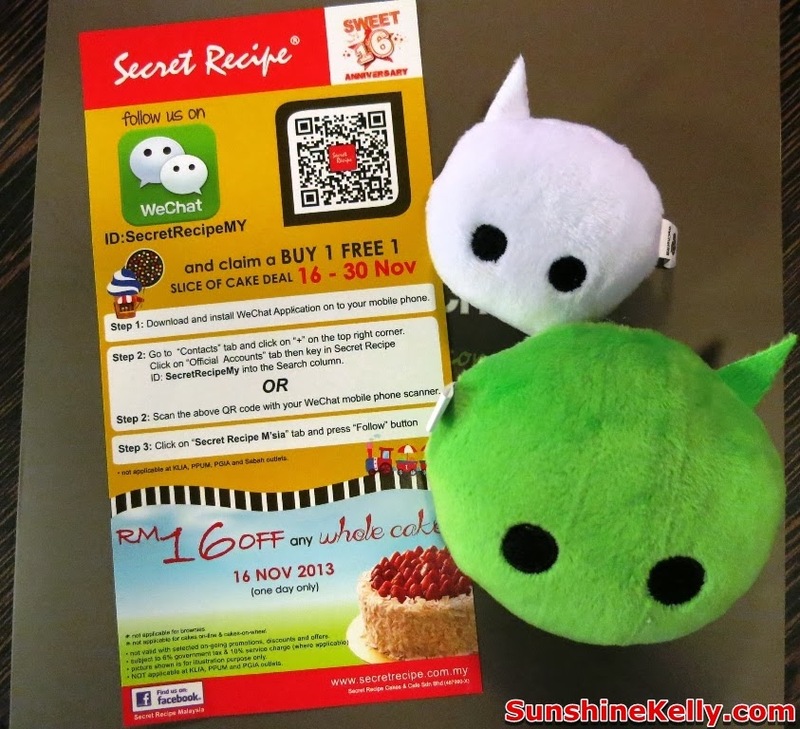 This super duper sweet awesome deal is only available for 1 day only. Oh ya, this Candy Crushing deal is not applicable for brownies, cake on-line and cakes-on-wheel. 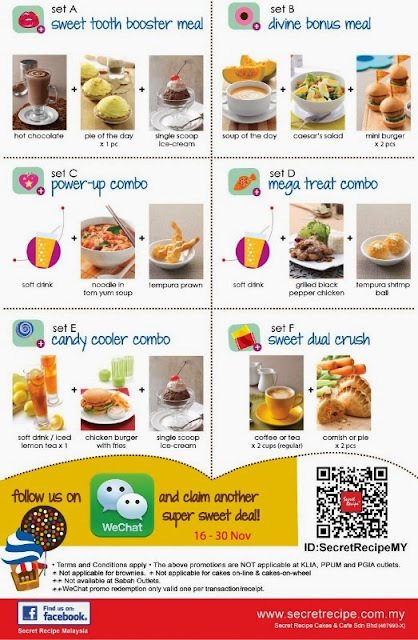 Well since you are dining at Secret Recipe, why not check out some of their Sweet 16th Anniversary combo or set meals such as sweet tooth booster meal, divine bonus meal, power-up combo, mega treat combo, candy cooler combo and sweet dual crush too. My favourite is the power-up combo because I love Tom Yum noodle. Are you having any cake this weekend?